The National Hispanic Cultural Center (NHCC) is looking for five AmeriCorps VISTAs (Volunteers in Service to America) to support projects focused on art curriculum digitization and helping artists build capacity by developing business plans, fundraising, accounting consulting, and marketing! VISTAs serve as full-time volunteers for one year, receive a living stipend, and other service benefits. If you have experience in art education, business development, website design, program coordination, working with diverse communities, or grant writing we'd love to hear from you. The complete opportunity listing and service benefits can be found at https://my.americorps.gov/mp/listing/viewListing.do?id=85417&fromSearch=true. 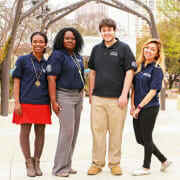 Please note that all applications need to be submitted through the My AmeriCorps website. Full time, 40 hours a week for one year. Applications must be submitted through link listed above.